Mom, I sure do miss you! The World's Second Largest Aquarium. Okinawa Churaumi Aquarium in Japan. Namasté or Namaskar (Sanskrit: नमस्ते [nʌmʌsˈteː] from internal sandhi between namaḥ and te) is a common spoken greeting or salutation in the Indian subcontinent. Namaskar is considered a slightly more formal version than Namaste but both express deep respect. It is commonly used in India and Nepal by Hindus, Jains and Buddhists, and many continue to use this outside the Indian subcontinent. In Indian and Nepali culture, the word is spoken at the beginning of written or verbal communication. However, the same hands folded gesture is made wordlessly upon departure. In yoga, namaste is said to mean "I am your humble servant" which you say to your instructor. Taken literally, it means "I bow to you". The word is derived from Sanskrit (namas): to bow, obeisance, reverential salutation, and (te): "to you". When spoken to another person, it is commonly accompanied by a slight bow made with hands pressed together, palms touching and fingers pointed upwards, in front of the chest. The gesture can also be performed wordlessly and carry the same meaning. In everyday life, "namaste" can be necessarily considered a religious salutation. However, Namaste is salutation that is a Sanskrit term which can be understood to mean, that I respect that divinity within you that is also within me. Also when greeting a peer, a "namaste" can be said together with hands in front of chest and a slight bow. To indicate deep respect, one may place the hands in front of the forehead, and reverence for a god or the holiest of persons may be indicated by placing the hands completely above the head. Namaste is also used as a friendly greeting in written communication, or generally between people when they meet. In some parts of India (for example, Punjabi-speaking areas), Namaste is used not only to greet Hindus but everyone. The proper greetings for Muslims are Assalamu Alaikum and for Sikhs Sat Sri Akaal respectively. But namaste is accepted in all religions. However in Sri Lanka, this usually has a somewhat different meaning. The gesture is used to greet (as well as a parting remark) people with the verbal "Aayubowan", hence it's called Aayubowan. Aayubowan roughly means 'may you live long'. When used at funerals to greet the guests, the verbal part is usually omitted. The aayubowan gesture is also a cultural symbol of Sri Lanka and Sri Lankan hospitality. This is also the means used by Sri Lankan air hostesses to greet passengers, and used in other hospitality settings. When the gesture is performed with hands in front of the chest it is usually considered as aayubowan. When hand position is higher it usually means reverence and/or worship. The higher the hands, or the expression with hands placed on top of one's head, is usually the sign of utmost reverence or respect. 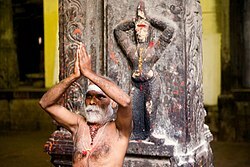 A sadhu performing namaste in Madurai, India. The gesture used when bowing in Namaste or gassho is the bringing of both hands together, palms touching, in front of the person—usually at the chest, or a higher level such as below the chin, below the nose, or above the head. This gesture is a mudra, a well-recognized symbolic hand position in eastern religions. One hand represents the higher, spiritual nature, while the other represents the worldly self. By combining the two, the person making the gesture is attempting to rise above his differences with others, and connect himself with the person to whom he bows. The bow is symbolic of love and respect. Particularly in Hinduism, when one worships or bows in reverence, the symbolism of the two palms touching is of great significance. It is the joining together of two extremities—the feet of the Divine, with the head of the devotee. The right palm denotes the feet of the Divine and the left palm denotes the head of the devotee. The Divine feet constitute the ultimate solace for all sorrows—this is a time-honored thought that runs through the entire religious ethos. Namaste is one of the few Sanskrit words commonly recognized by Non-Hindi speakers. In the West, it is often used to indicate South Asian culture in general. "Namaste" is particularly associated with aspects of South Asian culture such as vegetarianism, yoga, ayurvedic healing, and Hinduism. "I honor the place in you in which the entire Universe dwells, I honor the place in you which is of Love, of Integrity, of Wisdom and of Peace. When you are in that place in you, and I am in that place in me, we are One." "I salute the God within you." "Your spirit and my spirit are ONE." -- attributed to Lilias Folan's shared teachings from her journeys to India. "That which is of the Divine in me greets that which is of the Divine in you." "The Divinity within me perceives and adores the Divinity within you." "All that is best and highest in me greets/salutes all that is best and highest in you." That said, these are all arguably simply attempts at translating the same concept, which does not have a direct parallel in English. In buddhism, the concept may be understood as buddha nature. ^ Oxford English Dictionary, Draft Revision June 2003. ^ a b Sivasiva Palani (November 1991). "Never Shake Hands With God". Hinduism Today. ^ Chopra, Deepak (2007). Buddha: A Story of Enlightenment. Harper Collins. ISBN 978-0-06-087881-8. ^ Yoga Heals Us (2007). "Yoga Philosophyy - Namaste". Yoga Heals Us. Retrieved on November 10, 2007. ^ Dass, Ram (1976). Grist For The Mill. Unity Press. ^ TEDTalks (2005). "Rev. Tom Honey: How could God have allowed the tsunami?". Video Podcast. TED Conferences. Retrieved on November 10, 2007. ^ Finnegan, Dave (1993). Zen of Juggling. Jugglebug. ISBN 9780961552152. 1. Commit to at least one daily experience where you share something of yourself with no expectation of being acknowledged or thanked. For example, before Dyer begins his daily routine of exercise, meditation, or writing, he goes to his desk and chooses his gift for that day. Sometimes it’s just a phone call to a stranger who’s written to him, or perhaps I order flowers or send a book or present to someone who has helped him. It doesn’t matter if this activity is big or small—it’s a way to begin the day in-Spirit. 2. Become conscious of all thoughts that aren’t aligned with your Source. The moment you catch yourself excluding someone or having a judgmental thought, say the words “in-Spirit” to yourself. Then make a silent effort to shift that thought to match up with Source energy. 4. Remind yourself of this statement: My life is bigger than I am. Print it out and post it strategically in your home, car, or workplace. The “I” is your ego identification. Your life is Spirit flowing through you unhindered by ego—it’s what you showed up here to actualize—and is infinite. The “I” that identifies you is a fleeting snippet. 5. Dedicate your life to something that reflects an awareness of your Divinity. You are greatness personified, a resident genius, and a creative master—regardless of anyone’s opinion. Make a silent dedication to encourage and express your Divine nature.